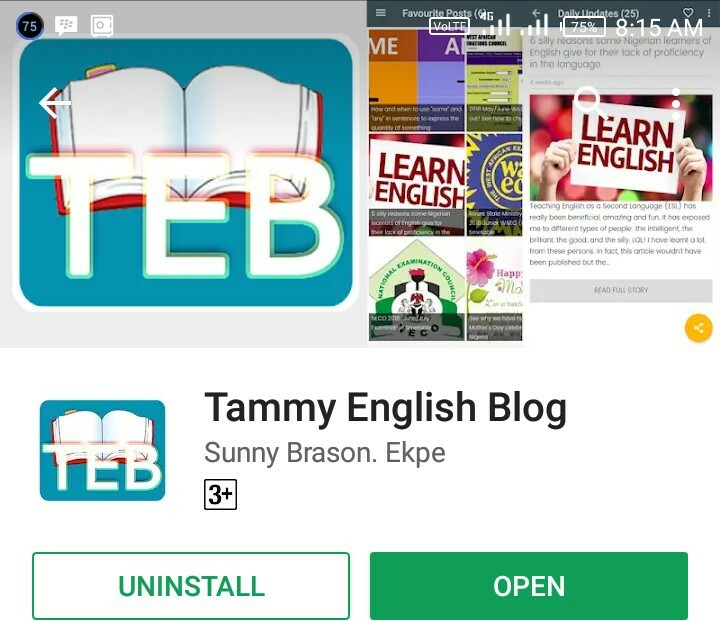 Tammy's English Blog has published the latest version of its android app on google play store – a version which is entirely different from the previous one. If you have the old version, all you need do is just to update it. But if you don't, kindly download the app using the download link that is provided in this article. Thanks for being part of this. Instant notification of daily updates. 1. Tammy's English Blog offers free online tutorials on English grammar and usage, Literature and effective writing. Always visit the blog for updates. 2. Tammy's English Blog gives its active readers and commenters a token at the end of every month. Start reading and commenting on Tammy's English blog to be eligible for this offer, and please, do not comment as anonymous. If you must comment as anonymous, make sure you include your name and phone number. 3. The blog also assists final year students of English, mass communication, Linguistics and Literature with their projects. 4. You can also get complete project on language, mass communication and literature on Tammy's English blog. However, the project should only serve as a guide while writing your project as Tammy's English blog doesn't encourage plagiarism. 5. You can as well get firsthand projects and topics on Tammy's English blog. 6. Has your lecturer/teacher given you a very difficult assignment, or has your supervisor given you an entirely new project topic? Contact Tammy's English Blog via our "Contact Us" page. 7. Tammy's English Blog helps advertise your business, short story, play, poem, articles, music etc. at affordable prices. On Tammy's English Blog, your language satisfaction and command of the English language remain our utmost priority!